Join us on Saturday, March 19th, at Bristol Seafood Grill in Creve Coeur as we celebrate and recognize those with 50 and 60 years of membership in the ACS. Bill Doub will be presented with the 2016 Distinguished Service Award for the St Louis Section. Bill has served the Section continuously in important positions dating back to the 1980s. Rhonda Woerndle will be awarded the Chemical Science & Technology Award. Rhonda is receiving this recognition not only for her scientific ability but also for her science outreach in the community. Many Past Chairs of the St Louis Section will gather, and the immediate past Chair of the Section Pegah Jalili will give an entertaining after-dinner talk. Bristol Seafood Grill is on the northwest corner of New Ballas Road and Olive Boulevard, about three blocks east of I-270 (map). See the poster for more information about the speaker and the talk. Parking is available in the West Drive parking garage. Committee chairships don’t turn over very often [so zealously are those appointments guarded by appointees (right? … RIGHT? )], so it is worth noting when one does. One of the biggest jobs we do as a local section is to recognize and publicize excellence in all aspects of the chemistry enterprise. That job is largely the province of the Awards Committee. 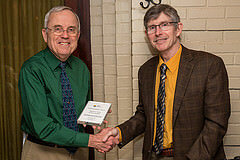 Mikhail Berezin, of Washington University Med School Department of Radiology has taken the reins of that committee, and we gratefully welcome him. Mikhail Berezin graduated with a PhD in Chemistry from the Institute of Oil and Gas and Institute of Organic Chemistry in Moscow. Prior to his academic career, he was a research scientist for Monsanto/Pharmacia/Pfizer and contributed to the development and launch of several drugs, including celecoxib. 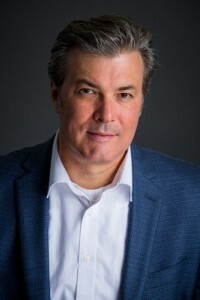 Following an appointment as an Assistant Professor in the Department of Radiology at Washington University School of Medicine, he focused on fundamental properties of fluorescent probes and their applications in medicine. He is a faculty member of two programs at Washington University: Division of Biology and Biomedical Sciences and Institute of Materials Science and Engineering. Mikhail is a PI and co-investigator on several NIH and NSF-funded grants. He established novel directions in the development of contrast agents and pioneered a new type of optical imaging modality. His work is documented in more than 50 peer-review papers, several book chapters, and patents. Addressing the importance of high-quality optical measurements, he founded the Optical Spectroscopy Core Facility with top-of-the-line commercial and developed-in-house instrumentation to serve scientists around the globe. 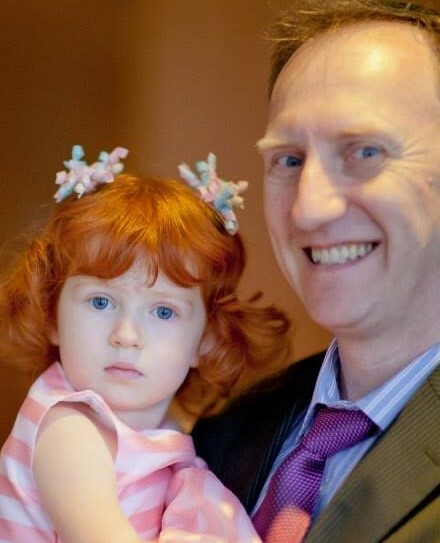 His most challenging project (after the Awards Chair) is a long-term spectroscopic study of red hair provided by his daughter Sophia. Students compete in two divisions, Regular Division for first-year chemistry students other than advanced placement, and Advanced Division for all others. Advanced Division exam is used to determine qualifiers for the 2016 National Chemistry Olympiad Exam. Note that the USA is not sending a team to the 2016 International Chemistry Olympiad in Karachi, Pakistan, due to security concerns, but students can still earn national recognition for their performance in this contest. Results will be sent by email. Winning students and their teachers will be guests of the Section at Awards Night (date and location TBA). Teachers: contact HSCC Coordinator Myron Reese to enter your students. Students who cannot attend this main testing event may come instead on Friday, March 11, 4-6:30 pm in the same location. 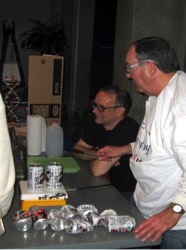 Benno Orschel and Don Sartor demonstrate Crushing Cans at the Kids and Chemistry at the Saint Louis Science Center for Chemists Celebrate Earth Day on 4/20/13. 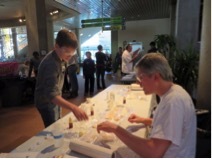 Louis Science Center for Chemists Celebrate Earth Day on 4/21/12. A new coordinator is being sought for the Kids and Chemistry program of our section. 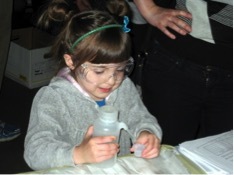 Currently this program reaches the general public by offering hands-on chemistry at the Saint Louis Science Center during Chemists Celebrate Earth Day (Spring) and National Chemistry Week (Fall). Supplies are purchased (budgeted allowance) and brought to the event and membership is solicited to join in the fun of helping with the hands-on science with the public. 400-600 participants are to be expected for each program from 10-4 pm on a Saturday. A leader for each experiment is necessary to train volunteers at the event. (Ideally, more than one experiment would be offered allowing more volunteers the opportunity to participant.) Contact Sheryl J. Loux for more information (sjloux@gmail.com; 636-237-5149 Cell). Sam Tadrus is helped by Chris Glass to do the Starch Scavenger Hunt at the St. Louis Science Center for National Chemistry Week on 8/26/13. Mirah Brengard experiments with filling a cup with a water bottle for the Enzymes experiment at the Kids and Chemistry at the Saint Louis Science Center for Chemists Celebrate Earth Day on 4/20/13. 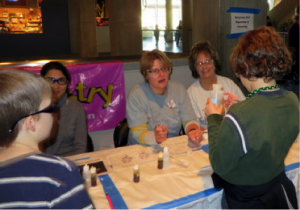 Pegah Jalili, Ann Feil, and Sheryl Loux explain about Enzymes Aid Digestion & Cleaning at the St. Louis Science Center for National Chemistry Week on 8/26/13. We invite you and your students to Career Day sponsored by the American Chemical Society. This is to be held at the University of Missouri-St. Louis in the Chemistry and Biochemistry Department. The date for this event is Friday May 6th, 2016 from 9 a.m. to 12 p.m. The objective is to introduce your students to careers involving chemistry and biochemistry and have them witness activities in those areas. It includes tours of research laboratories and instrument facilities, and Chemistry Demonstrations by the UM-St. Louis Chemistry Club. A lunch (pizza, etc.) starting at about 11:30 a.m. concludes the event. The tours follow a brief introduction where Just What is Chemistry and What Careers Involve Chemistry are considered. Chemistry and biochemistry are very much “central sciences” and other careers such as those in healthcare involve these disciplines. In the department tour, research in biochemistry, inorganic, organic, and physical chemistry will be featured and major instruments to be shown and demonstrated include X-ray Diffraction, Nuclear Magnetic Resonance, Mass Spectrometry and Electron Microscopy. Your school schedule is likely already very crowded, but please consider how valuable this experience may be for your students as they consider their college and future career options. Please respond by Friday April 22nd, 2016 to to Michelle Haley (haleym@umsl.edu, or phone 314-516-5311) to inform us that you will attend. Please let us know how many students will accompany you so that complete arrangements for food and setting up tour groups may be made. Please include an e-mail address in your response to this invitation. The day involves lots of activities so please plan to be punctual. For those who can attend, additional information will be provided subsequently by e-mail. We again are contacting science educators by e-mail rather than by traditional mailing. Please note: our budget for this event does not include the cost of transportation for attendees but free parking will be provided. Additional details concerning the program that is planned can be obtained from Keith Stine or Jim O’Brien; their contact information is given below.